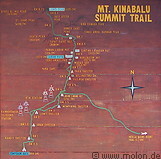 A selection of pictures of the trail which leads to the summit of Mt Kinabalu. Visitors start the climb at the Timpohon gate (1866m) and reach the Laban Rata resthouse (3300m) on day one. The vegetation along the trail changes with increasing altitude from tropical to alpine. Most climbers leave the resthouse the following day between 3am and 4am, reaching the summit before 6am, in time to experience the breathtaking sunrise. After that, the descent back to the Timpohon gate - 2300 meter of altitude difference - takes an exhausting four to six hours.